I’m now writing in earnest and over the coming months will share some of the stories as we lead up to the publication and launch of the book at Heffers in Trinity Street, Cambridge, in November 2016. 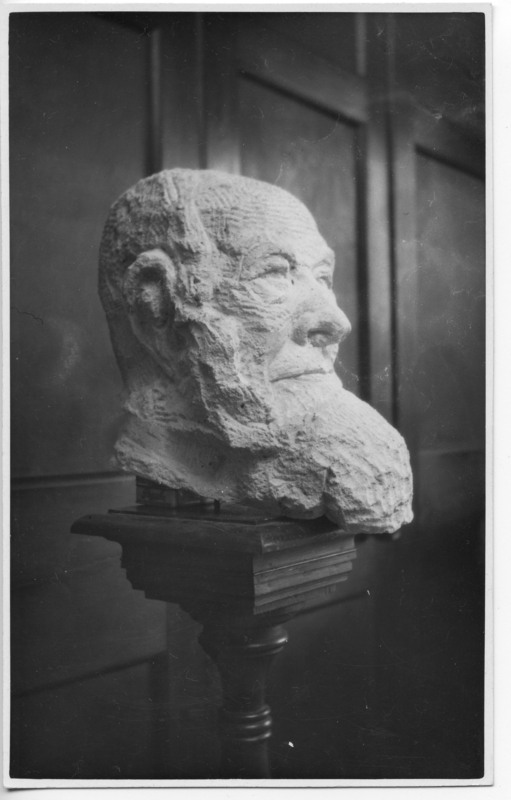 Meanwhile, an image has come to light of a bust of the firm’s founder, William Heffer. The image is contained in an envelope with “Ralph Heffer” written upon it in Stephen Heffer’s handwriting. Ralph (1893-1974), son of Harry Heffer and grandson of William, was not involved with the firm but according to his family, enjoyed working with his hands and would possibly have had a go at creating something like this. The Heffer family were not aware of the bust and we cannot ask Stephen who sadly died in 1996. 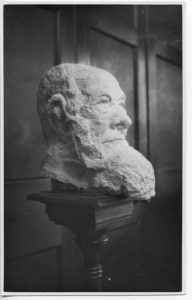 I hope the bust has not been destroyed and would be delighted to hear from anyone who knows of its whereabouts. Perhaps it is in someone’s house. My parents have a bust of my grandfather, Sidney Saunders. Or perhaps it is nestling in the corner of a college room or library somewhere. William had good relations with many Cambridge establishments and rented the shop at Petty Cury from Emmanuel College. Even if the bust has been destroyed, it would be nice to know who created it and when. Here is a brief biography of Stephen Heffer, a gifted artist who worked in the family firm. Son of John Heffer and great-grandson of William, Stephen worked with the firm for fifteen years from 1971. He assisted Managing Director, John Welch, on the bookselling and publishing side, and played an instrumental role setting up the Children’s Bookshop and the Bookworm Book Club. He also made regular visits abroad both in Europe and America, retaining very useful personal contacts with librarians overseas. His travels were noted regularly in the staff newsletter, Trinity Street News and he managed the Grafton Centre shop when it first opened in 1983. An artist, Stephen decided in 1986 to leave the firm in order to train at the Camberwell School of Arts and at Winchester. He then worked as an artist in Barcelona, London and Norfolk and he died in London in 1996. An exhibition of his paintings was held at the Sidney Street Gallery in 1998, providing, as described in the brochure, a unique opportunity for friends and visitors to view the breadth of his vision.